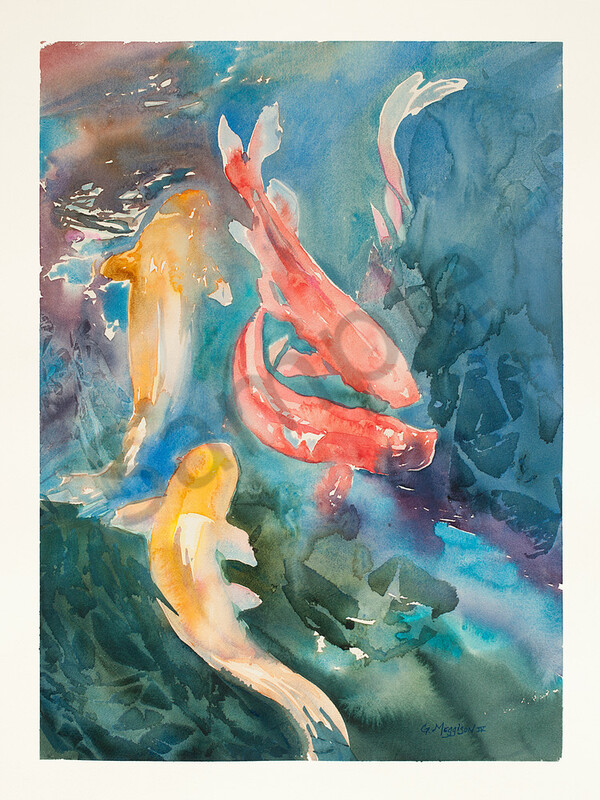 Koi Color is a contemporary 18"x24" Watercolor on 140 lb. Arches Cold Press Paper. (See the "Wall Preview" option below to select your room type, size preference and wall color to get a better view relative to the art). Koi Color is a contemporary 18"x24" Watercolor on 140 lb. Arches Cold Press Paper. I did this painting for a crowd of about 40 people. It was interesting and unnerving to ttry to be creative, but it turned out to be fun, a supportive group at the Cultural Center of Ponte Vedra Beach Fl, and the JWS Jacksonville Watercolor Society. (See the "Wall Preview" option below to select your room type, size preference and wall color to get a better view relative to the art). Koi Color is a contemporary 18" X 24" Watercolor on 140 lb. Arches Cold Press Paper. (I recommend printing on Fine Art Paper. See the "Wall Preview" option below the print size tab, then explore your designer wall color with the art). Koi Color was one of my demonstration pieces done for my classes. I was going for a looser depiction of the koi, so they are more about color than form. (I recommend printing on Fine Art Paper. See the "Wall Preview" option below the print size tab, then explore your designer wall color with the art).